Its iPhone 7 Plus vs OnePlus 5: Fingerprint & Camera Compared. After we had settled ourselves with OnePlus 3 and OnePlus 3T, the smartphone manufacturer OnePlus thought that its time to actually come up with a new flagship model, because hey, that’s what the company actually wants in the first place- Never Settle. And behold, the company gave us OnePlus 5. Facing a direct competition on the spec table from devices such as Samsung’s Galaxy S8, LG G6, and the Huawei P10 Plus; A YouTube creator, SuperSaf TV pitted the phone against another flagship killer, the iPhone 7 Plus from Apple. He figured out which one was better, in terms of fingerprint scanning and the much hyped dual camera setup. This test was done in a pretty straightforward and easy way. He kept both the phones on the table, and tried to unlock them using the fingerprint scanner at the same time. Now the OnePlus 5, just like iPhone 7 plus, has its finger print scanner at the front, and both of these work quite similarly. (Round 1) He first tried to unlock both the devices by locking and then simply pressing his finger against the scanner. And we had a clear winner- OnePlus 5. Without any animation, the OnePlus 5 unlocked directly to its home screen, showing no signs of lag and responding as soon as it detected the fingerprint. The iPhone 7 Plus on the other hand, was a bit slow; partly due to the small animation effect that it had before it got the user to its home screen. (Round 2) He then tried to unlock the phones from their lock screen. The procedure was pretty much the same, keep both the devices on the table, and then unlock both the phones by using the fingerprint at the same time. And the result? OnePlus 5 over iPhone 7 Plus. Even though the former surprisingly had a small animation before it got him to the home screen (the animation being very similar to the one in the iPhone), but even then it was still faster than the latter. (Round 3) To make things fair, he disabled the motion (in iPhone 7 Plus) and the animation (in OnePlus 5) and again unlocked the devices from the switched off display; once again the OnePlus 5 was faster than the iPhone 7 Plus unlocking in a moment. 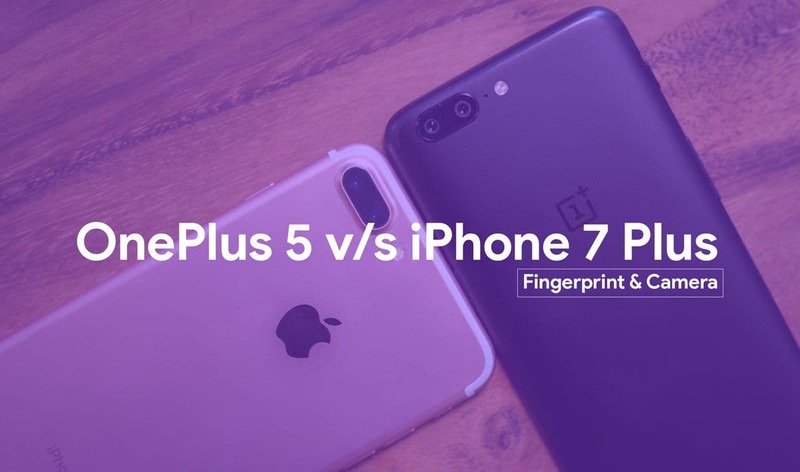 Performing all those tests and we came to the conclusion that the fingerprint scanner on OnePlus 5 was surely better and faster than the one on iPhone 7 Plus. The former getting unlocked instantaneously, as soon as it detected the finger. Let me tell you, I am starting to like the OnePlus 5 already! Since both the smartphone manufacturers have provided big and detailed technical specifications about the camera and video recording features of their devices, he had run tests on both the front and the rear camera, for image as well as videos. He switched between the front and the back camera, juggled between indoor and outdoor locations with varying light conditions, checked the image stabilisation features, and most importantly the dual camera setup. (Round 1- Lets Shoot!) He first started off by recording videos using the front facing camera in both the devices and personally, I found the video of OnePlus 5 better than that of iPhone 7 Plus. The video, recorded through OnePlus 5, was sharper and had a more vibrant color scheme but at the same time was a little less wide than the one made through iPhone 7 Plus. Also the video, when recorded while running, was found to be more stable in the OnePlus 5. Now when he tried to repeat those things using the rear camera in both the devices, the results were a bit different. At 4k, the video recorded through the iPhone 7 Plus had better stabilisation than the OnePlus 5, though both did well and both had some great quality. But the OnePlus 5 was more table at 1080p. The OnePlus 5 also seemed to have a faster and better AutoFocus when compared to the iPhone 7 Plus. (Round 2- Smile Please!) When he took daylight outdoor shots from the devices using the rear camera, I personally found the images clicked through OnePlus 5 to be better. Now this could obviously vary on personal preferences, but upon looking at the pictures, the one from the OnePlus 5 was found to be more pleasing as it had a more vibrant and better (default) color scheme, which is something I prefer. Upon using the zoom feature, the OnePlus 5 looks a little bit sharper because of its 20 megapixels camera, as opposed to the 12 megapixels camera in iPhone 7 Plus. Now when he worked with the cameras under low light conditions, the OnePlus 5 produced brighter indoor low light pictures as compared to the iPhone 7 Plus, while the latter produced brighter outdoor low light images. Coming to the selfies, the one taken from OnePlus 5 was a bit wider than the one taken from iPhone 7 Plus. The color scheme though, this time was a little bit better in the iPhone 7 Plus, and also produced sharper images than the OnePlus 5. When he moved to outdoor images in low light, the OnePlus 5 was a clear winner. The image was brighter and was not blurred. When he clicked the same picture using front screen flash, the image produced through OnePlus 5 was found to be better again. I don’t know why, but the pictures were a bit sharper when clicked through the iPhone 7 Plus under low light conditions, and that didn’t really made them come across as good enough. Users may vary on this, but I found the camera setup of the OnePlus 5 better than that of the iPhone 7 Plus. Though the Electronic Image Stabilization technique failed miserably for the OnePlus 5 while recording a 4K video, it surely came above the Optical Image Stabilization technique used in the iPhone 7 Plus when doing the same in 1080p; or recording a video through the front camera. And also the images were found to have a better color scheme when clicked through the OnePlus 5. But then all the fingers of our hand do not look alike. There would be a difference in view always, what do you think? Feel free and comment. Honor 8 Pro with Dual Cameras, 4000mAh battery launched in India.